The Connoisseur Collection is a range of seven unique and beautiful hand crafted acoustic guitars. Each is a one-off, a masterpiece, representing the finest work of three of the most revered independent luthiers in the world. Tone, playability, appearance – these guitars make no compromises, every one is exquisite in all areas. The timbers used were chosen specifically for their tonal qualities, seasoned naturally for at least ten years (often longer) and handcrafted to reveal the beauty inherent in the wood. Each guitar took between four and six months to make, its personality often evolving as the character of the wood guides the luthier, almost like the sculptor that reveals the beautiful statue hidden inside a block of stone. The Connoisseur Collection is for those who appreciate the value of something that is truly unique, those who want something crafted, not ”manufactured”. 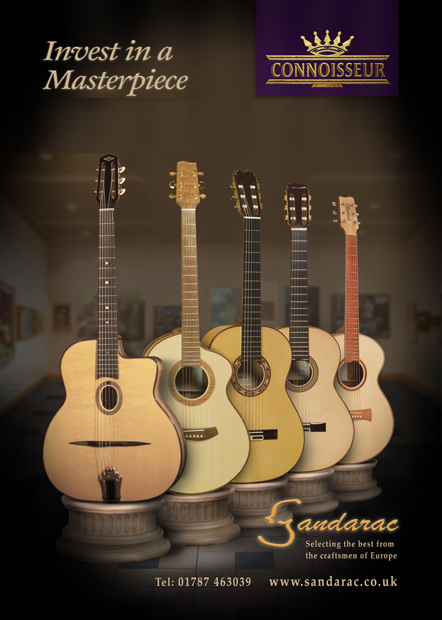 The Collection features examples of the work of three master luthiers; a superb French Busato gypsy jazz guitar from Maurice Dupont, Spanish Flamenco and Classical guitars by Ricardo Sanchis Carpio, and some unique, characterful and very special steel-strung acoustic guitars by Irish luthier John Catherwood. Maurice Dupont was the first modern day guitar-maker to build Selmer-Maccaferri style gypsy jazz guitars. Dupont still maintains the Reinhardt family guitars today and is quite rightly recognised as THE go-to luthier for, and world-renown authority on, gypsy swing guitars. Ricardo Sanchis Carpio is the head luthier at Hermanos Sanchis Lopez, Valencia, the business founded by his grandfather in 1915. Now in his 70’s, these days Ricardo devotes his time to crafting only the very finest concert standard classical and flamenco guitars. John Catherwood, as his contemporaries featured in the Connoisseur Collection, naturally makes a point of selecting his timber for its acoustic properties and beauty. However, John uses only wood from trees that have naturally fallen or were felled out of necessity and sourced in the main from Ireland. As a result, almost every one of his guitars has a unique provenance and inevitably an interesting story to tell. We invite you to browse the Collection and, if one of these fine instruments should speak to you and joins your own personal collection you can be sure you truly will be Investing in a Masterpiece. And now we are very pleased to be able to help you finance your purchase with the Recital Funding Solution. Please click here or call us for more details.